Last year was a bumper year for women’s sport and both interest and participation is growing. 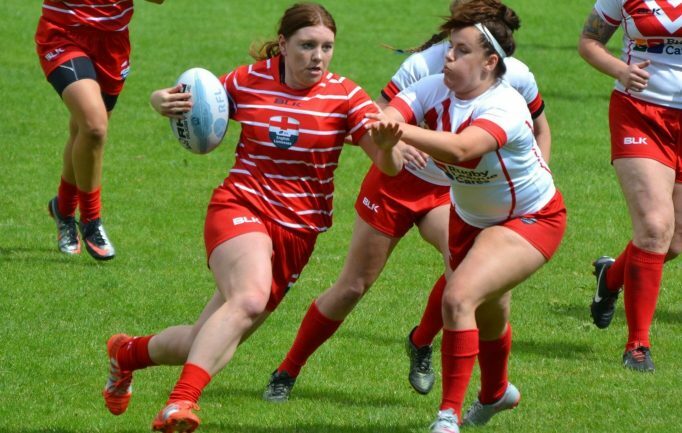 Women’s rugby league in particular is seeing welcome growth and this year in the women’s Super League there will be new teams as clubs dominant in the male game open their doors to female teams. For the first time Huddersfield Giants and Leeds Rhinos will play in the women’s super league joining the likes of Bradford Bulls and St Helens. We heard about Dannielle Anderson a sports mad 22 year old who has made the transition from athletics and the heptathlon to rugby league and we were lucky enough to have the opportunity to catch up with her, now officially a Leeds Rhinos player, and her father Neil to find out more about her journey into rugby league via the athletics field, and her hopes for the future. 4tlos: At what age and which sport did Dannielle first show interest and how did that develop? Dannielle: At school I took part in all the normal sports: football, netball, cross country but even as a child didn’t find 1 hour sport per week enough so took part in out of school activities. 4tlos: What out of school clubs did Dannielle attend? Neil: I was coaching at East Moor under 8s rugby league and Danielle used to come along and join in when she was around 6 or 7. Dannielle with a Player of the Year Award at Oulton. 4tlos: How did she get into the heptathlon and when did she get to train with Jessica Ennis? 4tlos: How old was she when it was clear she was going to be a talented athlete? Neil: She showed ability across the board from a really young age. She competed in 80m hurdles, 200 metres, long-jump, high-jump, shot and eventually moved into heptathlon. At Sheffield she trained in an indoor stadium and Jessica Ennis also trained there. 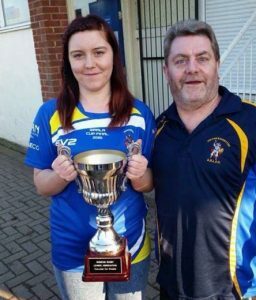 4tlos: Presumably Dannielle got her love for rugby league from her dad, did she watch you play or did you coach her – how did it all come about? Neil: I played rugby league from youth upwards and also ran for Wakefield Harriers, which is why I took both her and her brother there. 4tlos: Making the switch from athletics to rugby league how did that happen? Dannielle playing for Oulton against Bradford Bulls. 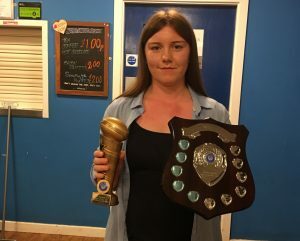 Dannielle: After doing athletics for a number of years the enjoyment started to wear off, then after starting college took part in rugby there and I knew this was something I wanted to start up again. A friend of a friend told me about Oulton so I went to a training session that that’s where it all started out. It was the best decision I have ever made because I have achieved so much whilst being there. 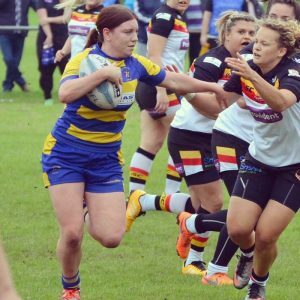 4tlos: Which teams has Dannielle played for and why the switch to the Rhinos? Dannielle: I have played for Oulton, represented Yorkshire and England Lionesses, I was in the squad for England. 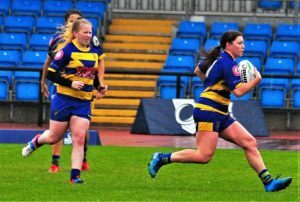 As much as I enjoyed it at Oulton I wanted to play at a higher level against the well-known teams such as Bradford, Featherstone and Thatto so when I heard the Leeds Rhinos were getting a women’s team together I thought this was a great opportunity to play for such a well-known club. The set-up is really good, the facilities we train in are the same as the men. It is really good! 4tlos: Was the selection process rigorous – how did she enjoy the challenge? Neil: Dannielle enjoyed the trials and was selected after the first one. 4tlos: What now are Dannielle’s sporting ambitions? Dannielle: This season I just want to play well and to the best ability I can. I would love to be a little bit faster as my dad always likes to remind me I’m not the quickest ha ha! If I do well in the next few years I would love to play in the next World Cup in 2021. 4tlos: Will we see professional rugby league female teams? Dannielle: There are quite a lot of women’s teams being set up lately through Super League Clubs. At the minute women don’t get paid for playing rugby but maybe one day in our future this could be possible. I would love to be able to play rugby full time and get paid for it, I am sure everyone would say the same. Neil: There will be some double headers this season with the women’s teams playing before the men’s which will help promote the game. The women’s game is close to being professional, the way they train and play, they just don’t get paid. 4tlos: Do you have time for any hobbies? Dannielle: Well I would say that rugby is my hobby, I don’t really have time for anything else. I go to work come home, get changed and its back out to training again. I really enjoy it though so I don’t mind. 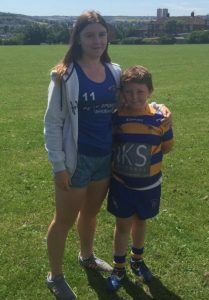 Neil: Dannielle and her brother also help their younger brother Jamie with his rugby league, taking him to training and games and helping him develop skills. 4tlos: Who are Dannielle’s sporting heroes or inspiration? We thank Dannielle and Neil for being so generous with their time and really look forward to seeing how the Rhinos and Dannielle do this season. In the longer term we look forward to seeing her pull on that England shirt and wish her all the best for the future. We hope to have an update later on in the season. Lead photo shows Dannielle playing for the Lionesses. I was lucky enough, under my Oops a Daisy CupCakes banner to sponsor Danielle for a couple of years when she was playing for Oulten Raidettes. The first time I saw her play I knew she was a very talented young lady. 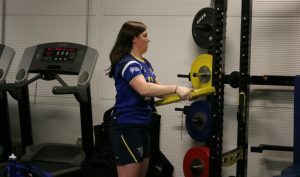 She is without a doubt a name to look out for in women’s super league rugby.